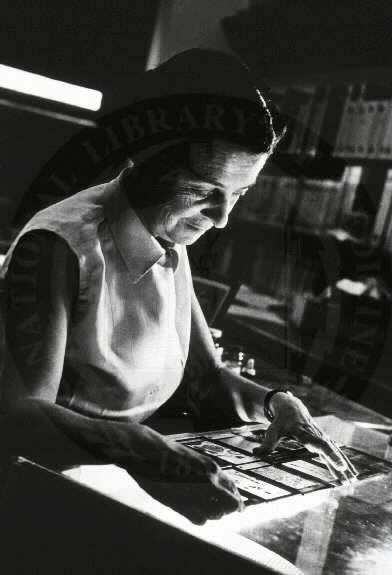 Born into a well-to-do Jewish family in Turin in 1909, Levi-Montalcini fought hard for her career from the start. First, there was her domineering father who didn’t believe that women should aspire to higher education. Despite his opposition, she graduated with honors in medicine from the University of Turin just before the outbreak of World War II. Her first mentor was Giuseppe Levi, a prominent in neurohistologist at the University of Turin. (Neurohistology is a branch of neurology that deals with the minute structure of animal and plant tissues as discernible with a microscope). In her autobiography In Praise of Imperfection Levi-Montalcini refers to him as “the Master.” He was an outspoken antifascist, renowned for his alarming fits of rage. But he was also the man who introduced her to her first passion: the developing nervous system. Under Levi’s guidance, she developed a technique that represented the key to her own success, that of silver-staining nerve cells. In the late 1930s Mussolini imposed the racial laws which forced so many Jews, including Levi-Montalcini, to leave universities and go into hiding. She told the audience at the EBRI how after these anti-Jewish laws were passed, she had to quit the university and conduct research in an improvised laboratory in her bedroom at home. Food was so scarce, she said, that after experimenting on chicken embryos, she would cook and eat the remaining yolks. “Above all, don’t fear difficult moments,” she said. “The best always comes from them. I should thank Mussolini for having declared me part of an inferior race. This led me to the joys of working, no longer at a university, but in a bedroom,” the scientist said. Between 1941 and 1943, Levi-Montalcini lived in a country cottage in the Piedmont region, and then went into hiding in Florence. After the Allied liberation of Italy in 1944, she worked as a doctor for refugees in Florence and in 1945 she returned to the University of Turin. 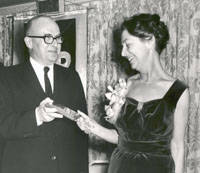 Two years later she moved to Washington University in St. Louis, Missouri, becoming associate professor in 1956 and full professor from 1958 to 1977. During that period she became an American citizen. She then went back to Italy where she was appointed director of the Institute of Cell Biology of the Italian National Research Council in Rome in 1969, a position she held until her retirement in 1978. Among the many struggles that characterize her life, there was one in particular regarding her research that stands out. Part of the scientific establishment refused to believe in the existence of nerve growth factor (NGF), the discovery of which eventually won Levi-Montalcini the 1986 Nobel Prize in Physiology or Medicine, along with her colleague Stanley Cohen. “That discovery was huge; it opened up a whole field of understanding how cells talk and listen to each other,” said neuroscientist Bill Mobley of Stanford University, an admirer for more than 30 years. Hundreds of growth factors are now known to exist and they affect almost all facets of biology. 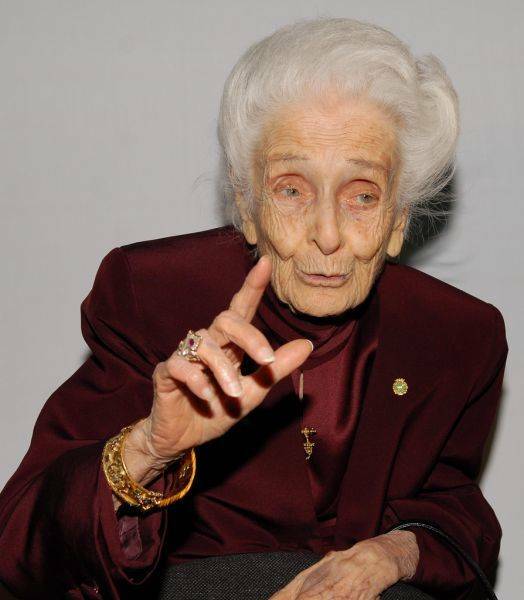 Despite her age, Levi-Montalcini still works every day, wearing elegant outfits, with the hair stylishly coiffed and her hands perfectly manicured. Her mornings are dedicated to her namesake European Brain Research Institute (EBRI)–Rita Levi-Montalcini in the suburbs of Rome, while in the afternoons she goes downtown to the offices of an educational foundation for African women that she created in 1992. Turning 100 is no reason to stop fighting. 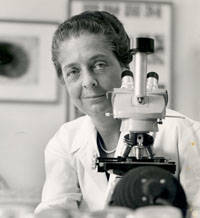 ““What I did in the past is not enough — there is only the future,” says Levi-Montalcini. She has never hesitated to use her senate position to push for better scientific research in the Italy. And today she has another important battle to fight, something very close to her heart: the survival of the EBRI, which she created in 2002, is now in financial jeopardy. During the celebration held at the EBRI, the new Nobel Hall was inaugurated and dedicated in her honor. 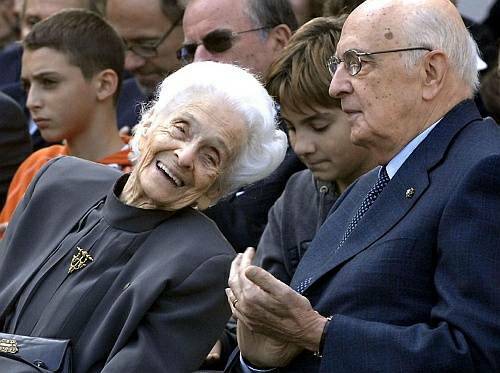 Levi-Montalcini was asked if she felt moved by this tribute. “The only thing that still moves me is life. I am deeply moved because I was able to reach this goal after having lived a life feeling an authentic joy and continuous curiosity.” Her words addressed to an attentive audience reflected a spiritual testament to having high moral standards. “The absolute evil of our times,” she forcefully stated, “is to not believe in values. After such an impressive speech given with customary simplicity, Rita Levi-Montalcini, with her white hair elegantly coifed and wearing a smart navy blue suit, raised a glass of sparkling wine and toasted her long life.